Search no further. You have found the Larry Dahlberg Whopper Plopper topwater fishing lure. 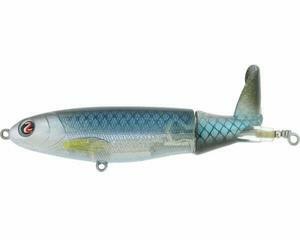 At high speeds, the River2sea Whopper Plopper throws its share of water. The loud popping noise that these whoppers make drive fish crazy especially the bass and muskies. The tail is made out of taught plastic which flexes well and springs right back into place after it has been chewed on by a big fish or hits something like a rock. This is the smallest of the models. The Whopper Plopper is 3 inches long, weighs .562 ounces and comes with an X Strong Treble #4 hooks. The model 90 is the next size up. It is 3.5 inches long, weighs .5 ounces and comes with a 4X Strong Treble #2 hooks. The model 110 comes in at a length of 4-3/8″. It weighs .75 ounces and comes with a 4X Strong Treble #2 hooks. The last model 190 is the biggest of them all. It’s 7.5 inches long and weighs 2.75 ounces. Comes with Long Shank 4X Strong #5/0 hooks. You will want a bunch of these the next time you go out fishing for those aggressive fish. The Larry Dahlberg Whopper Plopper is one of the most durable topwater lures you will find. Plenty to chose from for any fishing situation you might find yourself in. The x hooks are sharp and tough. The plastic it’s made out of is taught and will flex with every move of the lure while it plops its way through the water attracting those monster fish. There is a size for any type of fish you are after if it’s a hand-sized crappie or a 3-foot long musky. Larry Dahlberg has the Whopper Plopper for every occasion. This lure casts to long distances and attracts fish when other lures will not. Pick yourself up some of these lures today and get your self a lunker tomorrow! Nice article. It’s been ages since I’ve used any kind of fishing bait and with that said, it’s amazing to see just how advanced the bait is these days. If I were to go out to the Ohio River with friends this spring or summer, these are definitely worth the investment when it comes to catching fish from the river, though I wouldn’t recommend eating them (who knows what’s in that water these days!). I haven’t tried fishing before, by lately the kids have been bugging me to bring them fishing so I started reading up about it. I always thought you will need night crawlers as baits. And the thought of it make my hair stand on end. This is actually my first time coming across a plastic bait. Sounds like it is really durable and effective as a lure. Thank you for your recommendation! I will keep this as one of my option when I go fishing next time.